It’s the first half of October, we’ve just gotten past the contentious confirmation hearings for Supreme Court Justice Brett Kavanaugh, and the country’s attention has turned towards Hurricane Michael – the most powerful hurricane ever to hit the Florida panhandle. Somewhat lost in the shuffle of the ever-changing news cycle was President Trump’s big announcement concerning E15. Naturally, he did it during a stop in Iowa. What did the President really say and what are the implications for the hundred of millions of drivers here in the United States? Let’s unpack the President’s directives. To understand better, let’s review the current situation. Ever since E10 became the defacto land of the on-road diesel fuel land in 2006-2007, there’s been constant speculation about if or when the nation-wide limit would be increased from 10% ethanol (E10) to 15% ethanol (E15). Farmers and the biofuels lobby were all in favor, while industry groups like the Engine Manufacturers’ Association urged caution about using E15 in small engines because of possible damage. So what the country has been operating under for the greater part of the past decade is this dichotomy where E15 has only been available in certain areas of the country (only about 1,300 gas stations in 29 states offer E15) and has only been officially approved for use in on-road engines like cars or trucks. 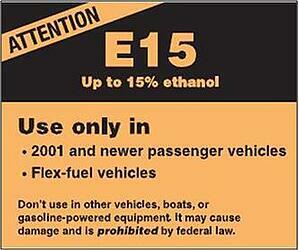 Want to use E15 in your lawn mower or boat? Technically, that’s not really legal. Nor was it a good idea if you were to listen to certain trade groups. With his announcement, did the president suddenly increase ethanol in gasoline by 50%? Not exactly. What he actually did was order the lifting of the summer ban on selling E15 fuel. Sales of E15 have actually been restricted in the summer months because E15 was thought to contribute to smog pollution problems – a curious position since the whole point of blending 15% ethanol is to reduce pollution. What the president officially did was direct the EPA to lift the summer ban on E15. Which means, as the president said, gas stations will be selling E15 all year round instead of just 8 months out of the year. News of the E15 directive is a little bit of a head scratcher for those who have paid attention to the Trump Administration’s previous statements about biofuels like ethanol. In general, the Administration hasn’t really been that friendly to the biofuels issue, even talking about taking steps to weaken the biofuels blending mandate, which is the driving legislation behind ethanol in gasoline anyway. The President has always framed the ethanol issue as an Obama-era burden on businesses and the consumer – a stance that mirrors the viewpoint of a lot of people who don’t like ethanol in their fuel and who view its presence as another example of government unduly intruding in their lives. Here, the President curiously seems to be reversing course. Now ethanol isn’t an Obama-era burden, it’s a great thing that we need more of. Unfortunately, ethanol in gasoline has become a big political football. So it isn’t surprising that the President’s announcement seemed to contain some political aspects to it. First, he made it in Iowa where corn is king and ethanol (from corn) is kind of like the, I dunno, Secretary of State or something. The announcement was made at a time where a significant amount of Midwestern political support has been eroding away due to the effects of the President’s tariff ware with China. Midwestern farmers have been hurt by depressed soybean prices (the Chinese buy lots of soybeans; at least, they did before the tariffs). This announcement can certainly be seen as an attempt to pull back some of that lost support. More curious was the throwaway line that the President used during his announcement. He said that the Democrats “want to kill ethanol”. For years, the President has framed the ethanol issue as a problem of “liberal Democrats controlling your lives”. The rhetorical question now is why the political party most perceived as being responsible for forcing ethanol gasoline on the American public is now the party that really wants to kill it. This post was published on October 18, 2018 and was updated on October 23, 2018.